Wood veneer bookcase with radius corners, finished back and adjustable shelves. Rich wood veneer bookcases with fully-finshed backs. Sturdy 1" thick shelves support up to 90 lbs. 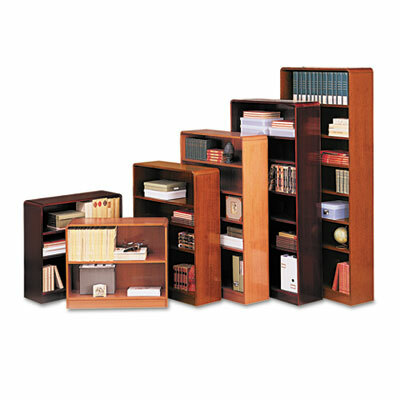 Generous 11-1/2" deep shelves accommodate three-ring binders and large publications. Shelves adjust in 1 1/4" increments. Quick-lock fasteners allow easy assembly. Shelf count includes fixed middle and bottom shelves.